Afnan Afnan is a PhD student at University of Illinois at Chicago (UIC), in Information and Decision Sciences department. 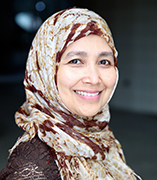 Her research interests include health information technology (electronic medical/health record systems), user satisfaction, healthcare social network, information sensitivity, and unintended consequences of technology use. Afnan received highest academic degrees: MM in technology from the University of Melbourne - Australia, and MSc in computing from the University of Manchester -UK. She has received the Humanitarian Service Award from the office of Illinois Secretary of State. She has presented her papers in AMCIS and ICIS conferences. She is a member of ACM and AIS. Afnan, A., and C Ranganathan. 2015. “Factors Associated with HER User Satisfaction in Small Clinic Settings,” in Proceedings of 2015 International Conference on Information Systems (ICIS), Fort Worth, TX. C. Ranganathan, and Afnan, A. 2012. “Effective Implementation of Electronic Medical Record Systems: Insights from a Longitudinal Case Study,” in Proceedings of the 18 Seattle, WA. Afnan, A. and C. Ranganathan. “Information Sensitivity in the Context of Healthcare Social Networks,” unpublished paper. Afnan, A. “Political Engagement in Social Networking Sites,” unpublished paper. Afnan, A. “Barriers and Facilitators to Personal Health Record Adoption – A Study of Healthcare Actors’ Involvement in the Adoption,” unpublished paper. Master of Science in Computing, The University of Manchester, United Kingdom, 2004. Master of Management in Technology, Melbourne Business School, The University of Melbourne, Australia, 1999. Bachelor in Computer Engineering, Surabaya Institute of Technology, Indonesia, 1994.